The world’s most comprehensive repertoire of birding tours, including easy-going bird and wildlife adventures that can be enjoyed by everyone, exciting birding tours to just about every popular birding destination on our planet and even pioneering and sometimes demanding journeys to the world’s last birding frontiers. We have shown our clients and friends more species of birds than any other birding tour company in the world: around 10,000 species using the IOC checklist (and not that far off the total for all other birding tour companies combined!). Our trips consistently do exceptionally well, owing to the excellence of our guides combined with our carefully thought-out trip logistics and itineraries. Just take a look at our trip reports for confirmation. Expert, helpful and friendly guides and office staff, with unsurpassed experience, whose aim is to ensure that every participant has a thoroughly enjoyable and rewarding tour. Low group size limits (typically ranging from 6-12, as appropriate for the birding conditions) and, as a direct result, a superior birding experience. Superlative trip materials, whether it is our tour descriptions, our checklists, our pre-tour information or our tour reports. 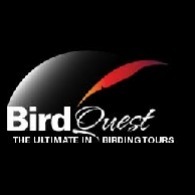 Price reductions for our regulars through our Birdquest Loyalty Bonus Points scheme. Birdquest tours are designed specifically for people who want to spend their entire tour birding (and watching other wildlife) while exploring the world’s wild places.